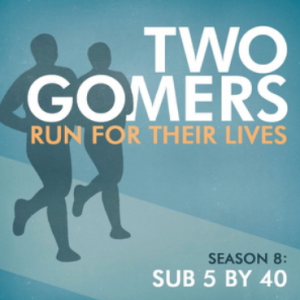 Both Gomers pulled out their LSRs this week (that stands for Long Slow Runs, emphasis on the SLOW), Gomer2 just barely. However, a new tactic has arisen that helped him get through the bonk – and no, it’s not imagining that he’s being chased by giant worms. Plus: Middle School dance awkwardnesses, birthday re-giftings, coffee jitters, and (Blue) Blu-Ray releases. Huzzah! And all your regular favorite sections: Week in Review, Listener Feedback, Running in the Media, two new Songs to Run To, and the final two Top Ten Tips from a Ten Timer. Happy Running! What is your most PAINFUL running moment? Whether in training or in a race, we want to know! Oops! Sorry Michele, it was wrong here on the website, but it’s all fixed now. Enjoy the episode! Sorry…but its still pointing to Ep#20. At least you know that people are anxiously waiting to hear you both. I did get it from iTunes though wanted to let you know it’s still pointing to the old Ep here. Argh! Ok, NOW it’s fixed. Right? Total Gomer moment, sorry. Been wondering… Who is Baka, keepin it rizio? What hurt more to me… 2 pretty painful ones. When I was 5. I was was playing at the front of my church and sitting on the stairs with my leg stuck out and the solid oak altar fell over and landed on the top of my leg. Broke my femur. Was in traction at the hospital for several weeks and wore a body cast for several months. When I was 11, I was playing Teenage Mutant Ninja Turtles with my friends. I was Leonardo, so naturally I was carrying a machete. Running through the woods with a “sword”, I fell and cut my leg open. Got to the house to check it out… Huge cut across my knee, could see bone… I had cut my tendon in half. I had to do a double-take when I first saw the picture of Kevin Bacon. I thought it was a picture of Steven and Anthony. What hurt more…running around and around the staircase in my granfather’s basement until I ran smack into my cousin Jeff holding a pencil straight out. I put up my hands to block the collision and the pencil went right into the tender part of the my hand right at the base of my thumb. The entire point was buried in there. We were six but I can still recall that base-of-the-hand weird twisting pain. Loved the Tremors reference! That was my favorite movie in middle school. Gomer2: totally impressed with your iron will in compleating that 14 miler! While playing football in college, I got tangled up with the player I was covering, fell down and his heel smashed my face. My teammates said my nose looked “real bad,” so one of them offered to straighten it out, a la in the movies (Say Anything comes to mind) when someone just kind of grinds it out to a straight position again. but (Steven!) I didn’t let him do it. Instead, I saw a doctor who “reduced” my nose (straightened it out and put a cast on it). He put a foot-long, steel rod up each of my nostrils and manipulated them with each hand until he liked the way my nose looked. Worst pain of my life. BTW, sorry for spelling your name incorrectly in my past messages, Steven. Dude… I started listening about a week ago and made it to Halloween, through the shingles and first relocation of the bus. I couldn’t stand it anymore so I did a super power dvr and just thought I’d check the site to find out your times. Gn2… Hang in there bro. You have been especially inspirational to me since I started listening. God is really using you in ways you don’t know. Have you two considered a charity race? The St Jude Memphis marathon is an awesome event and since u guys are practically celebrities now i bet you would set records. Fund raising records that is. I’m sure your time would be good too. Most painful running moment: AFTER my first 1/2 marathon (thank g-d). The worst (the WORST–did I say it was THE WORST) stomach pain and loose stools ever! Started about an hour or so after the 1/2 marathon, lasted like four hours, then just stopped and I felt better. During the episode, though, it felt like the old college moments from when I used to drink too much: “g-d, I swear I’ll stop drinking forever if you just make it stop!” Of course, in college it was puking, not loose stool! Wow, good memory–thanks for making me recall it!